We Earthlings sort of take it for granted that we can look up on a clear night and see the Moon out there in all its cratered glory. How often do we really think about how it got there? NASA just released a very cool animation illustrating the Moon’s violent history in celebration of the Lunar Reconnaissance Orbiter which has been in orbit for 1000 days as of March 19, 2012. 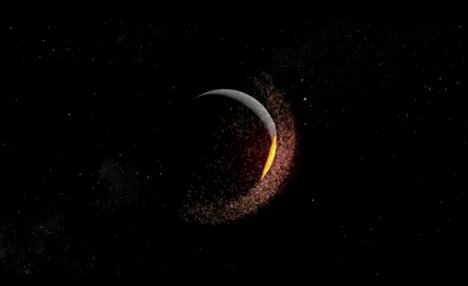 The animation is based on the current theories about the formation of Earth’s satellite: it was formed after a Mars-sized planet bumped into Earth and threw huge amounts of debris into space. That debris eventually formed into the rocky little satellite that we humans have since written hundreds of love songs about. The animation is not a scientifically realistic portrayal with its fictional sounds and liberties with time flow…but it is still very, very cool. See more in Space & Time or under Science. March, 2012.